7-12 business days from payment. See this page for details on how the lead time works. As of this posting, XPV ordering is open and will remain open until further notice. As you may be aware, the Sony US18650VTC5 battery we currently use in full size XPVs is seeing a global supply shortage. Theories of why abound, but the bottom line is we are finding it increasingly hard to get VTC5 batteries in a timely manner and at a reasonable price. Luckily, two excellent alternatives exist for DNA30 devices, which do not require all of the 30A continuous capacity offered by the VTC5 cell. These are the LG 18650HE2 2500mah 20A battery, which we already offer, and the Samsung INR18650-25R 2500mah 20A battery, which we are now offering. All three of these batteries perform essentially identically at the loads demanded by the DNA30 board. 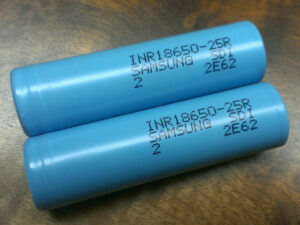 The Samsung performed very well in our testing and is now the default battery on XPV mods. The VTC5 can still be ordered while supplies last but there’s no guarantee we will be able to restock in the future, or offer it without charging a premium. We have posted the DIY instructions for the 510 upgrade. Again we do not recommend doing the upgrade yourself if at all possible. We have the experience of doing hundreds of these installs, while an inexperienced person doing it for the first time is likely to run into issues or at least frustrations. Black matte cases have been reordered, we expect them back in stock in 10-15 business days. If you have an order in the queue or would like to make an order for one, and would like to wait for the black matte cases, please contact us. Protovapor has always had an All Sales Final policy, which implicitly included preorders for XPV mods, however given the long lead times we have been flexible with those requesting refunds. With our shortening lead times, we now start the production process on an ordered mod much more quickly, meaning we incur costs sooner. This renders us unable to refund orders, so please order with that in mind. The Shipping and Returns policy page has been updated to be clearer on this. So, why can you only get a discount on an odd number of batteries? Was looking to get a replacement for my XPV and pick up a pair or two of 18650’s for another item I have, but you only get discount on odd numbers? The discounted price is a quantity price break, at 3 and 5 pieces.